We love Lincoln this time of year—the snow covers the city in a halo of white and the chill brings with it the holidays, time with family and an abundance of delicious food. Unfortunately, it also brings a myriad of risks to seniors including, but not limited to, an increased fall risk. A little fall may not seem serious to younger people who recover quickly, but falls are the leading cause of both fatal and non-fatal injury in seniors. Winter also ushers in increased risks of cardiovascular issues, illness, and hypothermia among other dangers. This week, we’re talking about ways in which winter is especially harsh on elderly persons and ways to mitigate risk this holiday season. As we mentioned, the increased fall risk associated with winter is a cause for concern with many older people. Icy sidewalks and driveways can lead to disastrous ends, but winter shouldn’t stop people from enjoying time outside or carrying on with normal life. If there’s a senior in your life who’s dear to you, don’t let them shovel their own sidewalks or driveway this year. By taking it upon yourself to do a quick chore, you’re drastically decreasing their risk of suffering a fall this winter. Don’t forget to sprinkle salt on all walkways that could be slick—even the walk to the car is long enough for a serious fall. Also test all railings for strength and durability as they’re the first line of defense in the event of a slip. Shoes with good traction may make a perfect gift for an older person this Christmas as shoes with weak or old soles can increase fall risks. Similarly, a new cane tip can do wonders for an older person’s mobility outdoors during the winter. Annual exams become even more crucial as we age. That’s because our immune systems tend to slow down, so a common cold can become a full-blown illness faster than you can say “flu shot.” If you or an older loved one hasn’t gone to an annual checkup, now is the time to do so. 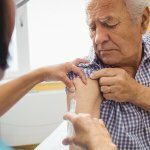 Something as simple as a flu shot can save time and money in medication or hospital costs down the line. Additionally, elderly individuals with conditions like cardiovascular disease or diabetes may have a tougher time staying healthy during winter. Diabetes can affect blood flow and make it difficult for your body to remain warm, while individuals with cardiovascular issues may be at increased risk of heart failure during the winter. Everyone gets sad sometimes, but for individuals who suffer from clinical depression, sadness takes on a whole new meaning. Unfortunately, lack of sunshine can increase depression in those who suffer from it, and we know that nearly 2 million seniors are already affected by it. Check in with older family and friends this winter, especially those who live alone. A simple phone call can truly make all the difference in a person’s day. If you’re an older person who takes medication for depression, talk to a doctor if you begin feeling worse during winter as you may need to either adjust your dose or implement additional measures to get back on track. For many older adults living alone, risk of fire or carbon monoxide poisoning increase during the winter. Fireplaces are a main culprit, but extra holiday cooking can also lead to issues if an individual forgets to turn off the oven or stovetop, especially those with stuck-on grease and grime that can easily catch flame. Check the carbon monoxide and smoke detectors of older individuals in your life to ensure they’re functioning properly. Additionally, calling an inspector for old fireplaces and cleaning the appliances of an older person may help mitigate the risk of fire or carbon monoxide poisoning. If you’re concerned about an older loved one living independently during the winter, you’re not alone. The Waterford is here to ensure that our residents stay happy, healthy, and safe all year long, and we’d love to talk to you about options for the senior or seniors in your life today!